The ongoing Swan River Restoration Project logged another successful year of undoing the damage of dredge mining, which took place a century ago. Revegetation work wrapped up in November on more than 30 acres of riparian and upland areas adjacent to the recently restored river. This work was supported by $100,000 in grant funding from Colorado Parks and Wildlife and the Colorado Water Conservation Board. OST staff and Rocky Mountain Youth Corps assisted in planting thousands of willows, upland shrubs and mature trees across the site. Gravel removal commenced upstream of the recently restored section of the Swan River, with over 70,000 tons of material leaving the site. Gravel removal operations have ceased for the winter and will resume in 2018. 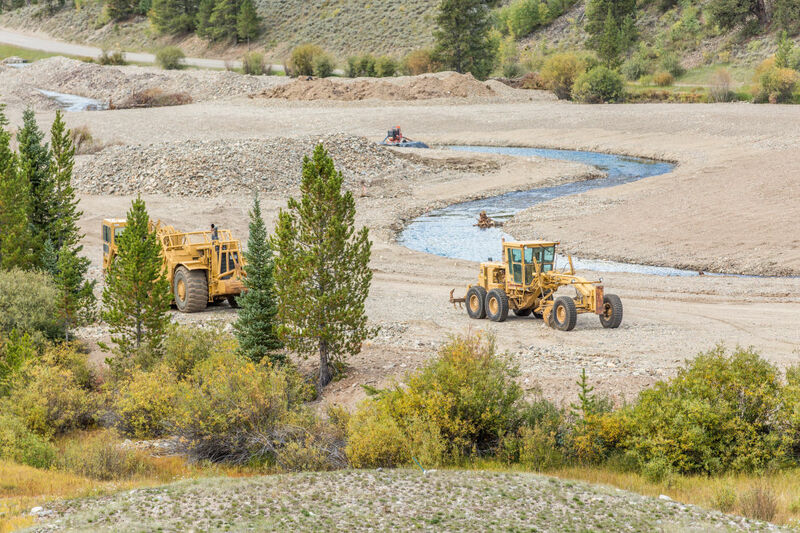 The Swan River Restoration Project is occurring in collaboration with numerous partners, including the Town of Breckenridge and the U.S. Forest Service. Additional information is available at http://www.RestoreTheSwanRiver.com and http://www.SummitCountyCO.gov/SwanRiverBlog. Summit County’s abandoned-mine cleanup efforts in the Peru Creek drainage took another step forward in 2017. On the heels of a successful multi-year effort at the Pennsylvania Mine, Summit County coordinated with the U.S. Environmental Protection Agency to address contaminated water draining from the Jumbo Mine into Peru Creek, a major tributary to the Snake River above Keystone. Summit County purchased the land surrounding the abandoned Jumbo Mine in early 2016 for public open space, setting the stage for EPA’s cleanup work. OST also facilitated efforts to reclaim two settling ponds near the Wellington Neighborhood in Breckenridge, to improve safety and aesthetics and create a transit bus turnaround. 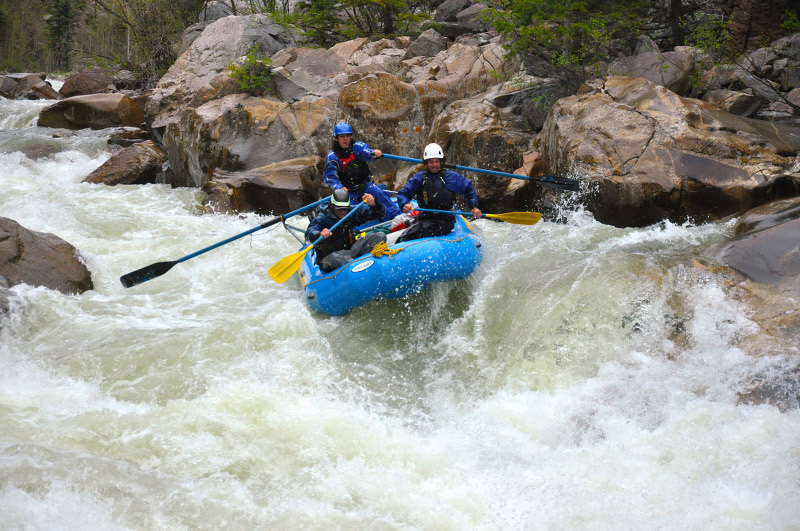 No Name Rapid, Class V, mile 10, Upper Animas River, Mountain Waters Rafting. So far, 21st century flows in the Colorado River are on average significantly lower than 20th century flows. 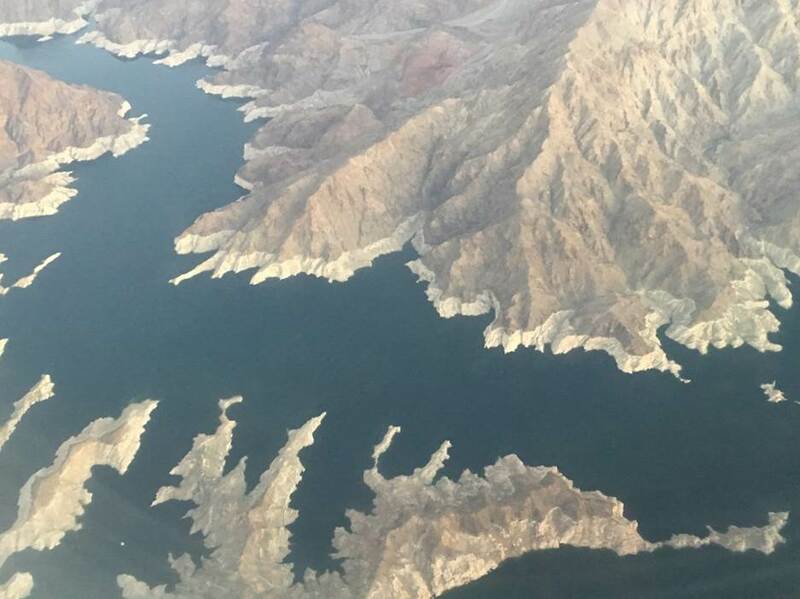 Updates on how climate change is reducing flows in the Colorado River and “drought contingency plan” negotiations are provided in this recent article in The Desert Sun and this KUNC story. Denver saw 14 record highs this year and no record lows, according to the National Weather Service. 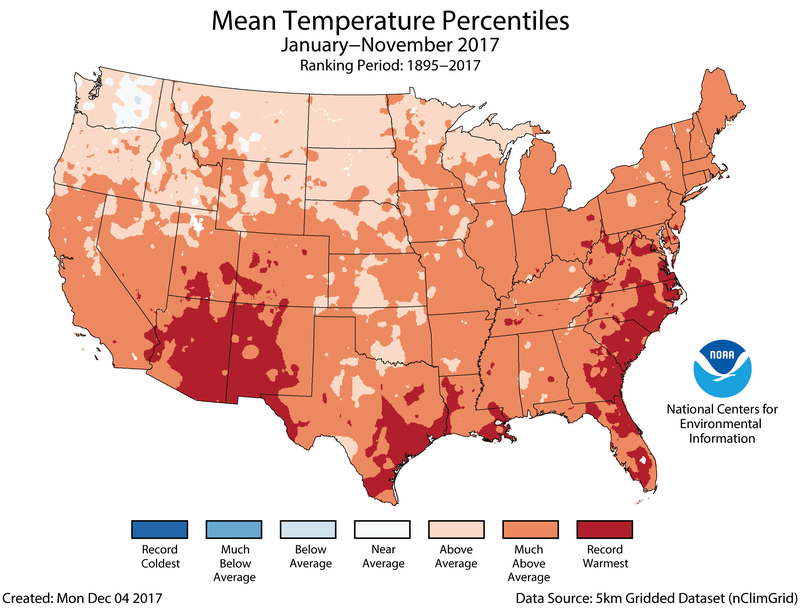 Those numbers include three monthly highs for February, September and November. The metro area hasn’t set a record low since last year on Dec. 17. Official temperatures for the metro area are recorded at the Denver International Airport. State and federal agencies task the office of Environmental Health and Safety at CU Boulder with ensuring everyone on campus does their part to keep our water clean by preventing chemical waste and other pollutants from being disposed of into storm drains and sanitary sewer lines. As a large, eco-conscious community at CU Boulder, we have the great opportunity to become educated and work together to reduce our impact on stormwater. Small amounts of contaminants from all over the landscape add up to cause pollution in our water. It is important to remember even the little things matter. You will make a difference, no matter how small, if you can adopt simple habits and change the way you look at water quality. Do not dispose of chemicals down the drain. Report anything suspicious or unusual around stormwater. Clean up after your pets, and do not litter. Do not maintain or wash your car in public areas, where runoff will easily flow to storm water. #NewMexico: Gov. Susana Martinez appoints Jack King to Interstate Stream Commission. Gov. Susana Martinez announced Friday (Dec. 22) she had appointed Jack King, a Lincoln County rancher, to the Interstate Stream Commission. Three of the commission’s nine members resigned in October, citing issues with the commission’s legal ability to manage the state’s water. King is also a retired chief of the New Mexico Environment Department Environmental Health Bureau. The governor also appointed John Cyle Sharp of Clovis to the state’s Soil and Water Conservation Commission. “He is a rancher and board member of the National Association of Conservation Districts,” the press release states. 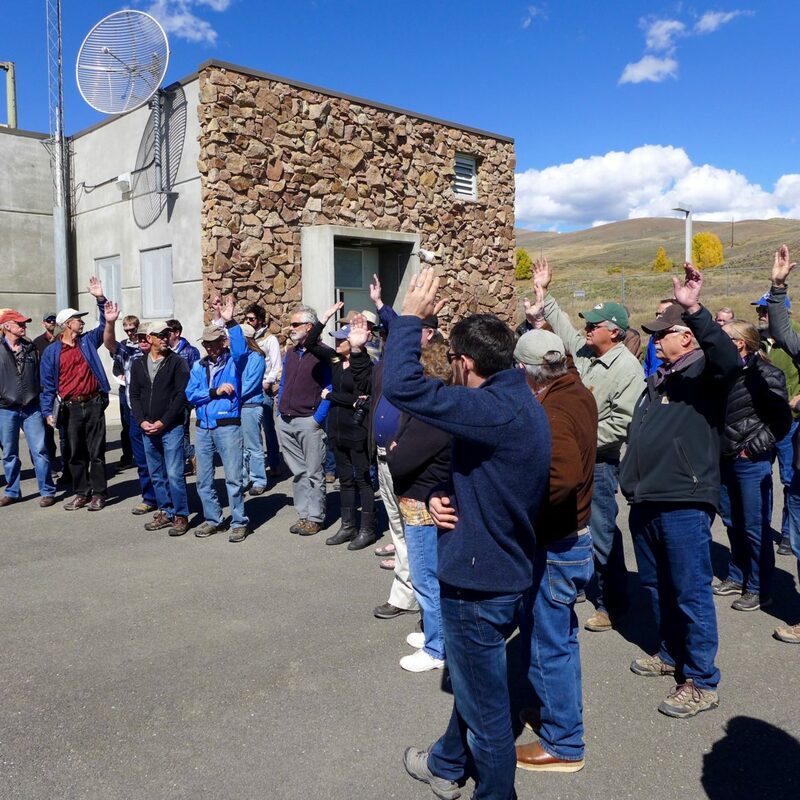 Members of the Colorado River basin roundtable raise their hands during a tour of the Windy Gap Reservoir in September. Water education, on both the Western Slope and the Front Range, often involves tours of water storage and transport facilities. 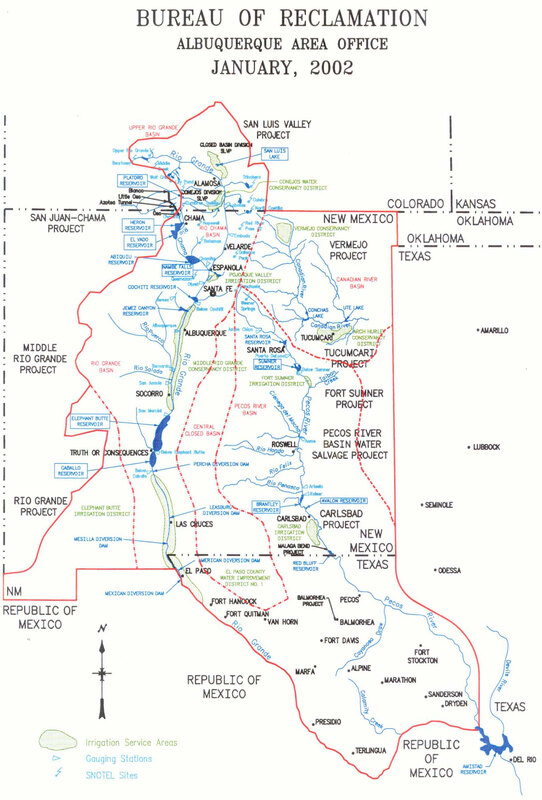 COLORADO RIVER BASIN – Developed by the Colorado Water Conservation Board and presented to the governor in November 2015, the state water plan recommended creating a data-based water education plan, creating a new outreach, education and public engagement grant fund, and improving the use of existing state education resources. While many water professionals are beginning to understand the importance of education, one Colorado River Basin Roundtable member has long understood the importance of an education and communications strategy. At-large roundtable representative Diane Johnson is also the communications and public affairs manager for the Eagle River Water & Sanitation District. In this position, she works in a variety of ways to engage the community, including through weekly spots on local radio station KZYR to talk about things like the preventive maintenance of drain cleaning, safe drug disposal (not flushing them down the toilet) and other issues the district faces. The district also staffs a water station at the farmers market, which Johnson said is a fantastic opportunity to talk with people about how the district brings safe drinking water to the masses. A group of rafters in Fruita preparing for a river trip on the Colorado River this summer. 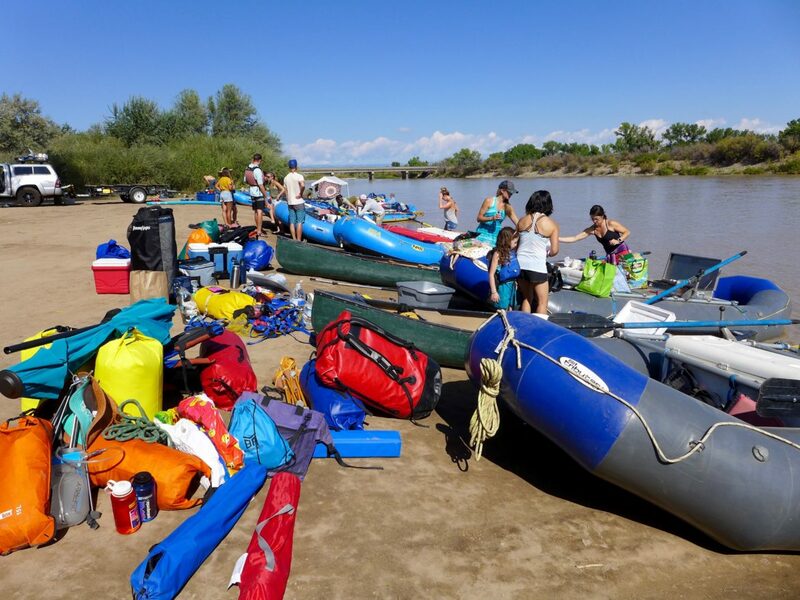 Many water professionals in Colorado are working to educate people about water, and many people’s interest in the subject is formed on recreational river trips. The Colorado River Basin Roundtable, which meets in Glenwood Springs, has not formally “gone pro” in terms of hiring a specialist. Johnson said she sees the benefits of the Colorado roundtable having a position focused on education, but there are currently no plans to hire anyone. The roundtable is working on launching and updating a website as a means to get information to the public about its message, goals, and projects. The nine basin roundtables were established in 2005 to facilitate discussions on water management and encourage local solutions. While there is information about each basin roundtable on the Colorado Water Conservation Board website, some roundtables have created their own website, including the Gunnison and Arkansas roundtables. Two Front Range roundtables have created a position that will help implement their education action plan, their basin implementation plan, as well as Colorado’s Water Plan. The South Platte and Metro roundtables, which meet in Longmont and Denver, respectively, joined forces this fall and hired Lacey Williams as their first-ever education coordinator. The two basin roundtables (the Metro Basin is located entirely within the South Platte Basin) first combined their resources in 2014-’15 to provide educational outreach activities, but this is the first time a position has been dedicated solely to education. Williams, who has worked with the Rocky Mountain Water Environment Association and American Water Works, will provide information on water projects and studies and encourage community and stakeholder participation in discussion of issues and solutions. Williams will be paid $44,000, and her contract runs through 2018. A Water Supply Reserve Fund grant provided by the Colorado Water Conservation Board and administered through the Colorado Watershed Assembly funded the position. Executive director of the Colorado Watershed Assembly, Casey Davenhill, said the sheer number of new people moving to the Front Range is a main reason the education coordinator position is needed. 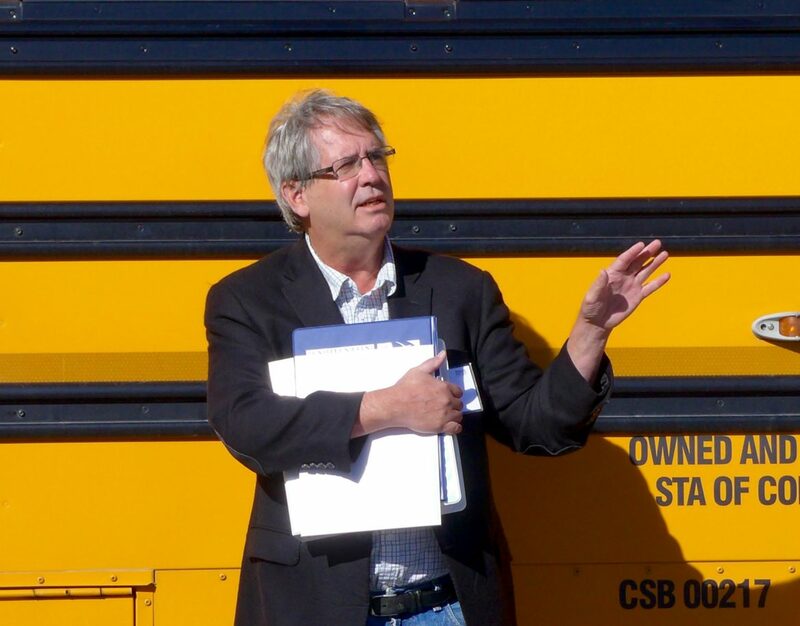 Casey Funk, the senior water attorney at Denver Water, speaking in Grand Junction this summer about the Colorado River Cooperative Agreement, a copy of which he is holding in his arms, during a water education tour put on by Colorado Mesa University. The agreement took years to negotiate between Front Range and Western Slope interests and is one key to understanding how water is managed in Colorado. The statewide, nonprofit group Water Education Colorado is also prioritizing the importance of educating the public and has rebranded itself to help achieve that. Created by the state Legislature in 2002, the organization was previously called the Colorado Foundation for Water Education. In October, it rolled out the new name to match its new ambitions. The organization has two main goals: developing skills and knowledge through its water leaders program and publishing a variety of news and information, including Headwaters magazine. The organization is looking to hire a content manager to organize all the published information from the last 15 years to make it searchable on the website, as well as a water reporter. Editor’s note: Aspen Journalism is collaborating with the Vail Daily, the Summit Daily News, The Aspen Times, and the Glenwood Springs Post Independent on coverage of rivers and water. The Vail Daily published this story on Wednesday, Dec. 27, 2017, in both its print and online editions. The Summit Daily News published it online on Dec. 27. And The Aspen Times published it on Dec. 30.